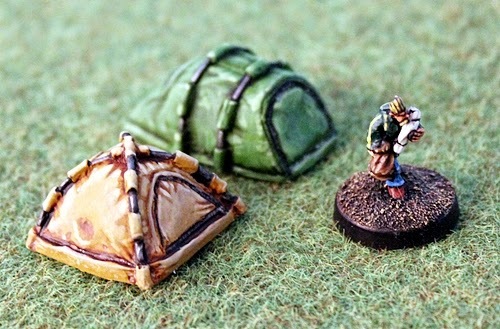 Mr Harolds Magical Miniature Review of our Modern Tents! I got a lovely surprise at the weekend when Mr Harold (he of Clear Horizon and Dropship Horizon fame) emailed me to give me a link to the above video which he has posted up to YouTube. A video review of our recently released FST01 and FST02 15mm Modern Tents packs. The video is well worth watching and is informative as to the use of the tents and some scale comparisons to our own and other makers brands of miniatures including his own excellent Hell Divers. And a nice picture of them to show you what they look like all painted up by our studio. Mr Harold tells us that he is painting his tents up as a research set in whites and greys with logos. I look forward to seeing that. HOF27 Maginot Defence Turret released! It is the year 2100 and the Resource Wars are in full swing on Earth. Nations feud to take what they can from a dying world that is all out of succour for her greedy children. The richer power blocks have established small colonies on Mars and on the Moon in partial terraforming and in dome. While the use of nuclear and chem-bio weapons is outlawed it is more out of fear than respect of life. War is everywhere and the battle lines are in field and city both. For the winners there will be places among the stars a series of Human Colonies and for the losers only the arid taste of the towering exhaust of plumes of the mighty Ark Ships that are even now being built. Welcome to the year 2100. Warfare is never cheap and the Maginot was designed by a committee to a price point that even the most corrupt future government could live with. Poured from pre-made mega molds with cheap concrete and supplied with minimal fixtures the Maginot can be seeded across miles of border lands or huge cities to provide a fixed point to dispense 'justice and peace'. This pack contains the resin and white metal pieces to assemble one 15mm scale Maginot Defence Turret. The Maginot is a stationary structure that acts as a strong point for your forces in play. Designed as a feature of the Human Colonial Army template in Alien Squad Leader 2.0 it is equally at home in any near future or such game system. Parts are: Turret Main Body, Turret Ring (rotatable in mount when assembled), Turret Top, Cannon Barrel and Non Lethal Barrel (a choice of two weapon options). Approx 35mm tall when assembled. Easy to assemble and great value. The Maginot is part of Security Force Alpha (SFA) in the HOF Range. From battles to peace keeping or law enforcement roles it suits them all. A great 15mm wargaming kit and excellent value too. Choose from a pack or three packs (saving 10% automatically on the price) supplied unpainted and without bases. Some assembly required. Mono image shows parts. Go HERE. The parts of HOF27 easy to assemble! All across the Human Colonies and on Terra itself there is a need for security after, during and even before the high rollers and expensive kit arrives in the battle zone. Security Force Alpha is just that force filling in as police, paramilitaries, mercenaries and planetary militias too. They are the faceless grunts that do the thankless jobs needed by all those who govern, control or enforce. Use them as you will from the near to the far future! The Security Force Alpha (SFA) range contains more than fifty different poses of 15mm white metal miniatures and vehicles allowing a wargamer to assemble a cohesive force for their campaigns. A whole integrated range within HOF which will be expanded even more. See them all HERE. Thanks Everyone Salute Season is now over! Its been a month of real fun and extreme activity for Alternative Armies, 15mm.co.uk and The Ion Age with promotions, new releases and special rates all leading up to the mighty Salute 2014 wargame show in London at the weekend there. The Salute Season is now over. We are getting back to normal now and while it will take us a few days I wanted to thank everyone who ordered across our websites, those who gave us kind words and those who took the time to speak to us at the show. It means a lot and its my one time a year to meet customers face to face and to chat to fans and followers. I had more than one hundred conversations on Saturday on subjects from Flintloque to Patrol Angis, from USEME Prohibition Gangsters to Age of Might and Steel and Alien Squad Leader too. I got to meet others in the industry and what fine hard working fellows they all are each with a firing imagination and a love for miniatures and wargaming. Alternative Armies decided to host The Ion Age on the trade stand this year and it got great feedback with dozens of new customers and admiring comments too. Next time we may do something different but being such a diverse company there are many possibilities and there is a lot of time until the next show. We gave out near the two hundred free IMP08 Muster Girl miniatures we took with us (one with every purchase just like online) and Malig Madness was fully sold out along with the new HOF28 Charger APC kit which is out this week on the website. What will be the theme of next year's Salute show? No one knows at this point. No one knows anything about the future of Salute at this moment but for Alternative Armies it will be another month of fun around and at the show you can be assured of that! Thanks Everyone here's to 2015! 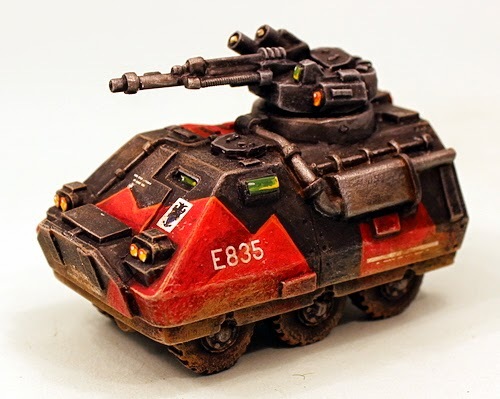 HOF28 Charger APC kit revealed at Salute 2014! HOF28 Charger Armoured Personnel Carrier with Turret. HOF28 with HOF104 SFA Elite Trooper for scale. This pack contains the resin and white metal pieces to assemble one 15mm scale Charger vehicle kit as an APC or turreted APC variant. The Charger is the workhorse military and police transporter of the Human Colonies and Security Force Alpha. Designed as a feature of the Human Colonial Army template in Alien Squad Leader 2.0 it is equally at home in any near future or such game system. Parts are: Charger Hull, Charger Wheel Unit, Turret and Top Hatch (a choice of two configurations), Cannon Barrel and Non Lethal Barrel (a choice of two weapon options) a pair of hatch covers and a twin launcher unit which can be sited anywhere on the vehicle. Approx 60mm long and 30mm tall (without turret) when assembled. Easy to assemble and great value. Make yours a military vehicle or law vehicle and choose pure APC or infantry fighting vehicle. The Charger is part of Security Force Alpha (SFA) in the HOF Range. From battles to peace keeping or law enforcement roles it suits them all. Full details will be in the release post for HOF28 Charger APC...enjoy! 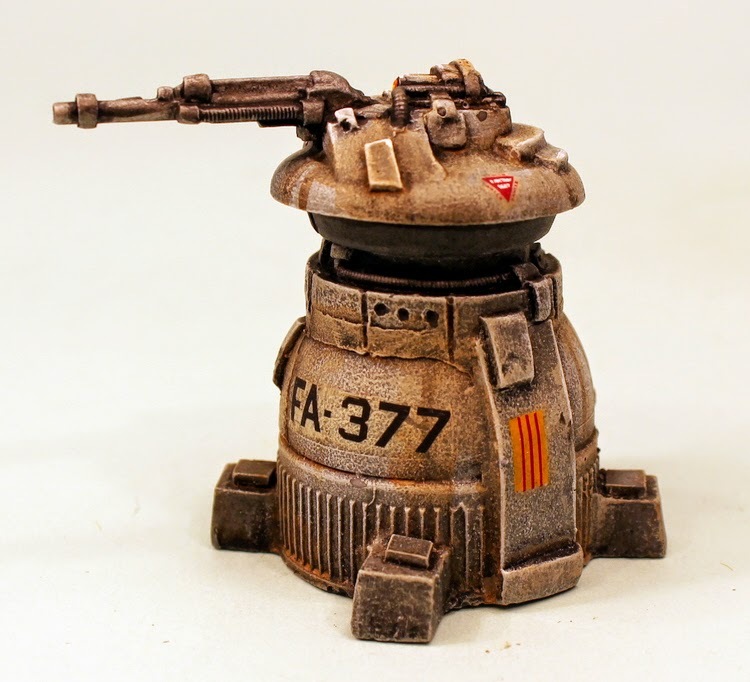 HOF27 Maginot Defence Turret revealed at Salute 2014! 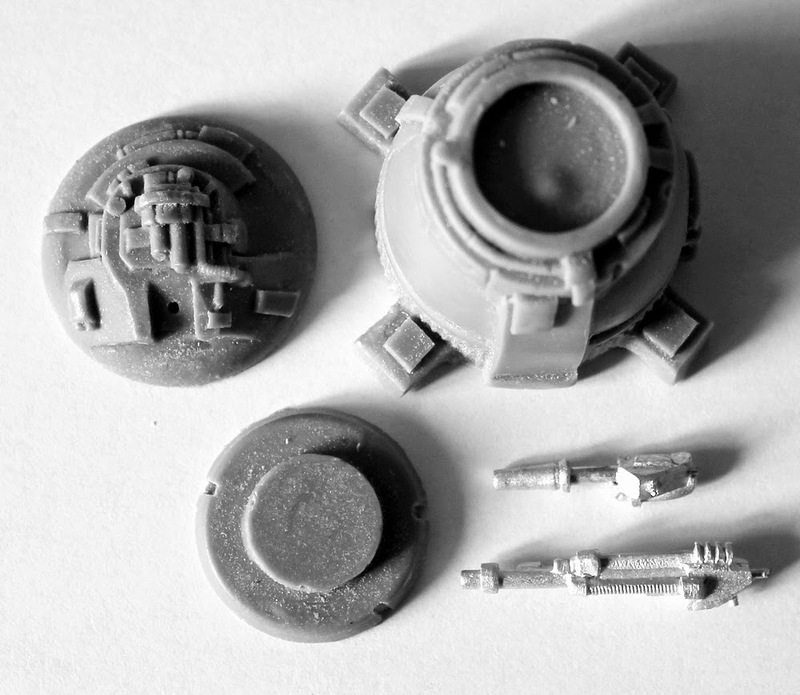 This pack contains the resin and white metal pieces to assemble one 15mm scale Maginot Defence Turret. The Maginot is a stationary structure that acts as a strong point for your forces in play. Designed as a feature of the Human Colonial Army template in Alien Squad Leader 2.0 it is equally at home in any near future or such game system. Parts are: Turret Main Body, Turret Ring (rotatable in mount when assembled), Turret Top, Cannon Barrel and Non Lethal Barrel (a choice of two weapon options). Approx 40mm tall when assembled. Easy to assemble and great value. The Maginot is part of Security Force Alpha (SFA) in the HOF Range. From battles to peace keeping or law enforcement roles it suits them all. 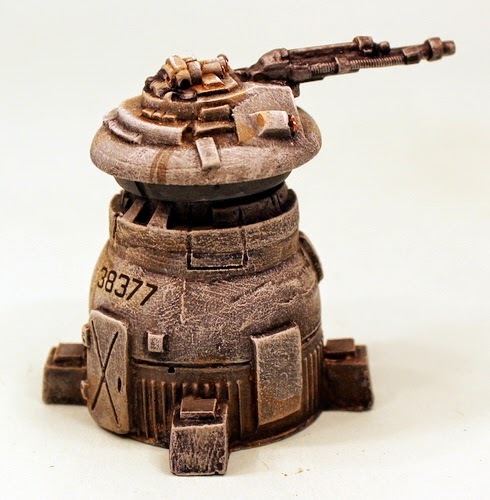 Full details and more images will be in the release post for HOF27 Maginot Defence Turret...enjoy! Tiny Solitary Soldiers paints up a Space Raptor! This came up on my feed this morning tied to 15mm.co.uk. 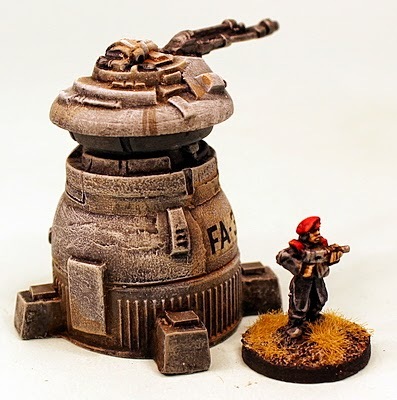 A lovely painted up example of the Loud Ninja Games 15mm Chuhuac space raptor. You can see it above. Here is a link to the post. You can find the whole range of Loud Ninja Games on our website including this one miniature from RAP001. These are unique miniatures commissioned with passion by Eli Arndt. Have a browse. 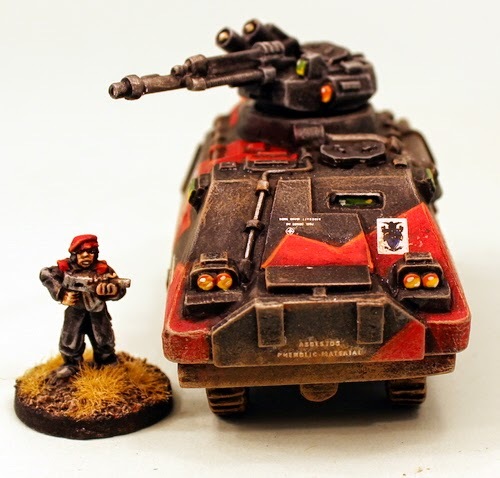 Lastly the author of TSS, Space Jacker, has said on his blog post that his interest in wargaming posting has moved away from Blogger in favour of Instagram. I hope personally that he changes his mind and at least copy pastes to his blogger site as it is easier for me to look at and follow. If you feel the same then comment on the thread on his post. He is a great fellow and a fine painter and modeller. Last Call for 'Collect on the Day' Salute Orders! Look for the banner at stand TF07! The title says it all really. The Salute 2014 show is on Saturday 12th April 2014 at Excel in London. 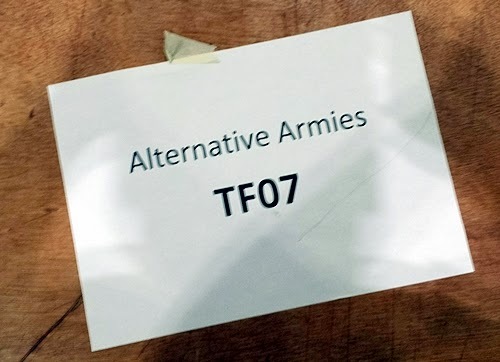 We are on Alternative Armies trade stand number TF07. The trade stand will have all of the Ion Age 15mm product range plus brand new revealed releases. Codes IAF046, IAF047,IAF048,IAF049,IAF050. We will also have brand new and from the last month products from 15mm.co.uk (Loud Ninja Games, Laserburn Vehicles, Tents, Prang etc) and some printed titles and that is it! Thar' be space for no more matey upon the stand! The cut off for placing orders for 'collection on the day', that is orders for which you select no postage and instead opt to get your package from my own hands at the trade stand on the 12th is NOON GMT on Wednesday 9th April. So please place them now! Any later than this and it will not be with us as its a long drive to London. The postage option for this is called 'collect at Salute' on the screen. The discount code for 15% off will remain active until Monday 14th April for normal orders being shipped worldwide. So if you are not attending treat yourself all the same. The code is to be entered in the checkout process into the discount box and when entered your total on screen will reduce automatically by fifteen percent. The code is ' salute01 '.